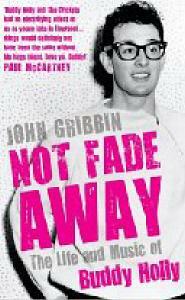 Published on the 50th Anniversary of his premature death, renowned science writer John Gribbin turns his hand to celebrating the life of Buddy Holly. Buddy Holly is one of those artists who transcends generations and has influenced many people. I have a bit of a soft spot for Holly and place him alongside Glenn Miller as artists that I have in my own collection that are out of place but sit quite proudly on my shelf alongside music that may well be part of the evolution of music, but sit far removed from it. It is obvious from this book that Gribbin is a fan, and this is part of the problem with this book overall. The facts and the timeline appear to be well researched but the author tends to wear his heart on his sleeve. Whilst it is true that Holly was an innovative and influential artist, Gribbin seems to put Holly on a pedestal. This is most obvious when comparing cover versions of Holly tracks, one particular comparison is where he talks about Nick Berry's version of Heartbeat as insipid. Now I'm not a staunch defender of Nick Berry's musical efforts in any way, let's be clear on that (please), but to be fair this Sunday evening family TV version is not that far removed from the original. This book is also quite heavily stat driven with chart placings in the US and UK used to show how Holly's native country didn't recognise his genius and then including Australian chart positions when the UK ones also fail to recognise how great a single was. Facts and figures are the lifeblood of scientists and there are a lot here, even with full tracklistings of any album mentioned.